On August 9, 1940, representatives from each area in Texas met in College Station during the state in-service training meeting. The result of this meeting was the formation of the Vocational Agriculture Teachers Association of Texas. The VATAT was established to promote and advance agriculture education in Texas and provide legislative representation to safeguard agriculture education programs. The Association informs agriculture teachers about the latest agricultural education practices, encourages higher standards of teaching agriculture and provides agriculture education a unified voice in the state legislature. 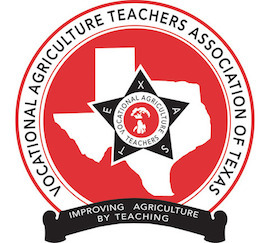 On August 9, 1940, the Vocational Agriculture Teachers Association of Texas was established. The VATAT state office was located in Waco, Texas, until it was moved to Austin in 1954. During World War II, the VATAT was able to secure and sell tires to its members even when rubber was rationed and hard to attain. This is seen as one of the VATAT's first successful ventures. On February 16, 1947, the Board voted that dues should consist of 1/2 of 1% of the teacher's annual salary and to set up a full-time association office. The first VATAT membership dues were set from $3-$5 based upon salaries of $1,800 to above $2,400 per year. VATAT Tenure Awards were established January 17, 1948. March 13, 1965, the Texas Association of Teachers of Vocational Agriculture (TATVA), merged with the VATAT to become one organization. The TATVA was organized in 1945 to serve African American agriculture science teachers. November 23, 1966, the VATAT office moved out of its rented space and into its new building at 307 East 14th Street in Austin. The second VATAT office was built in 1974 on 12th Street. In October 2002, the Texas Ag Ed Family moved into rented space at the Farm Credit Bank building, 6210 Hwy. 290 East, Suite 410 in Austin. A new facility built at the 12th Street location was completed and opened its doors in November 2003. It is named the Agricultural Education Ford Texas FFA Leadership Center.